Isola Maggiore is a wonderful encounter with history, culture, arts, crafts, environment and gastronomy. A unique experience all to live. Isola Maggiore is part of the municipality of Tuoro sul Trasimeno, has an area of 24 hectares, is therefore relatively small despite its name, in fact Isola Polvese is the largest of the three islands of Trasimeno Lake. Isola Maggiore is the only of the three islands of the Trasimeno to be inhabited again. The 18 people who populate the island live in the western area, along Via Guglielmi, the main street. The characteristic feature of the island still retains the atmosphere of the village of the ‘400 fishermen, in fact, in the past, fishing was the main source of livelihood of the island. In 1803 the island came under the jurisdiction of Castiglione del Lago, for the disposal of Pope Pius VII. In 1875, at the behest of the islanders, who at the time were about 200, the territory was included in the municipality of Tuoro sul Trasimeno. In 1887, the Marquis Giacinto Guglielmi bought the Franciscan monastery and the adjacent church, turning it into a private castle. The castle remained the property of the Guglielmi family until 1975. When you arrive to Isola Maggiore you arrive at a small square, from here going to the right, towards Via dei 3 Martiri, you can see the characteristic wind mill, while going up Via San Michele Arcangelo you arrive at the homonymous church, on top of the island. To the left instead follow Via Guglielmi and the lake promenade. Along the brick-paved street you begin a journey back in time, between the fourteenth century palaces and houses of the seventeenth century fishing. The two oldest parish churches (XII century) and the Casa del Capitano del Popolo (XIV century) testify to the splendor reached in the centuries from the small island community. It is can to admire Villa Isabella built, in the late nineteenth century by the Marquis Guglielmi, on the ruins of a church and a Franciscan monastery dating from the early fourteenth century. You can also visit the Chapel reminding the landing of San Francesco, when in 1211 he went to a hermitage on the Isola Maggiore to pass Lent in “solitude and fasting” and the rock where the saint stopped to pray. The island also houses the Museo del Merletto, as the tradition of lace “point of Ireland”, a special process made crochet lace, is characteristic of Isola Maggiore. 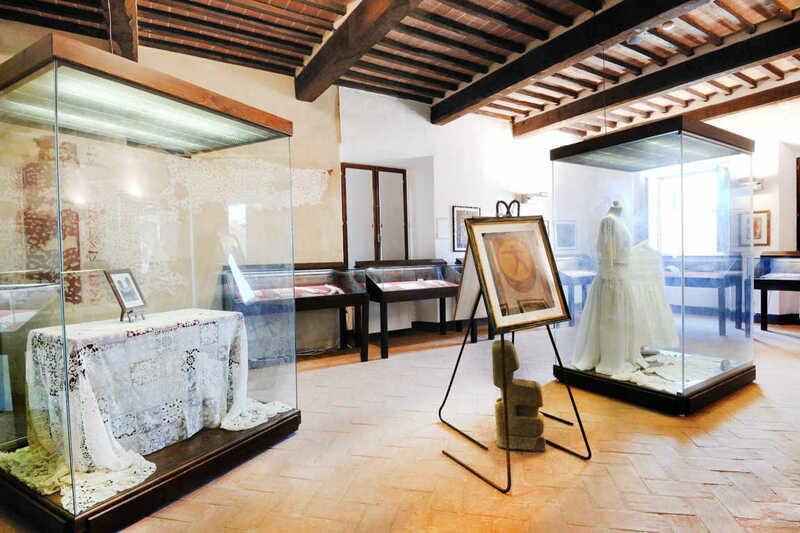 This tradition dates back to the early ‘900, when Elena, daughter of the Marquis Guglielmi, who a few years he had built a villa-castle on the south shore of the island, decided to create a profitable business for the island’s women, and founded a school lace. For this purpose he brought from Turin an expert teacher in the “point of Ireland”, an elaborate lace made with a cotton thread worked with a very thin crocheting. A girl of Isola Maggiore, Elvira Tosetti, first learned this art and later taught it to the other island. In a short time the young were able to increase the family economy realizing clothing and home accessories, required by the noble ladies who frequented the Marquis Guglielmi. Even today, along Via Guglielmi, you see women intent on achieving these craft masterpieces. At “Museo del Merletto” are on display some of the best examples made. Closed from 2 November until Easter.